This Filipino adobo recipe takes you to the rustic, quintessential Filipino comfort food. Pork and Chicken are the most popular meats to cook Adobo style but you can practically do it with any kind of meat, seafood or vegetable. It is tangy from the vinegar, a little salty and it usually tastes better the following day. Adobo is the easiest stew to make and all the ingredients are readily available in the pantry. Add sugar and banana blossoms and you have Paksiw na Pata. Add Bagoong Alamang or Shrimp Paste sans the bay leaf and you have Binagoongang Baboy. 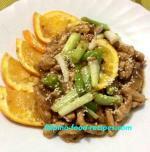 Add pork liver and you have Kilawin. Add tomatoes and potatoes and you get Mechado. 1 Mix the pork, vinegar, soy sauce, bay leaf, half the garlic and onion and peppercorns in a pot. Bring to a boil and DO NOT STIR. 2 Simmer for 20-30 minutes until pork is tender. Add the water at this stage if it's drying out before the meat gets tender. 3 Saute the remaining garlic and onion of a separate pan, then add the meat without the sauce. 4 Stir for 2-3 minutes, then add the sauce. You can take out the bay leaf at this stage. Bring to a boil. 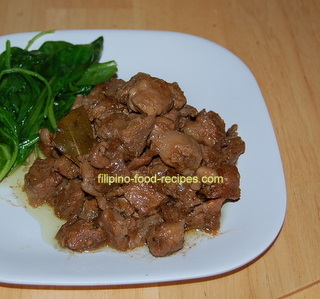 5 The Pork Adobo is ready to serve with rice. If this Filipino adobo recipe is too tangy for you, substitute half the vinegar with water. The vinegar mixture is left to boil with the meat and it shouldn't be stirred or the vinegar will taste fresh and uncooked. Though not traditional, I like my adobo without the bay leaf. I fry the leftover then make a sandwich in a bun.